I have long wanted to visit New Zealand. I have always heard that it is a really beautiful country, with friendly people and unspoiled wilderness; but what really prompted me to go ahead and buy the plane tickets was seeing the incredible scenery in the “Lord of the Rings” movies, which were filmed there. So in early November of 2004, Jineen (my barn manager and best friend) and I set off on a long anticipated vacation down under! This is an account of our trip to New Zealand, and our adventures there. My motive for writing this journal was mainly for my own satisfaction; it is a way to remember the details of the trip and to have the opportunity to relive a great experience. I also thought there may be some people who would be interested in hearing about it; thus the posting of this report on my website. But many of the things I have written here were much more interesting to experience than they might be to read about. WARNING: This account may be boring to those who weren’t on the trip! You are strongly advised to STOP READING NOW! I fell in love with New Zealand even before leaving home. The casualness and friendliness of the NZ people is legendary, and it was evident even during the planning process. When I called to reserve a rental car on the South Island, the reservations guy asked my name, but he didn’t take down my address, phone number, or credit card. He asked my flight number, and said someone would meet us at the baggage claim holding up a sign with my name on it. I asked him if he didn’t want a deposit to guarantee the car, but he replied, “No worries, mate, just ring us up if you change your plans.” Can you imagine that happening here in the US? Or anywhere else, for that matter? We set out from Dulles Airport feeling a strong sense of eagerness to experience this country that so far we had only seen in photos and films; and also with a small sense of uneasiness! We hadn’t done a lot of advance planning in regard to our itinerary. Both Jineen and I love to explore, and we wanted to have the freedom to go wherever we pleased and to see where we ended up each day, without being tied to a definite schedule. To this end I only booked the first night’s lodging in advance; we hoped we wouldn’t have too much trouble finding rooms at the spur of the moment. I had read quite a bit about NZ on the Internet, and I had ordered some guidebooks, which we studied on the plane. One thing quickly evident was that there was way more to do and see than we would possibly have time for. We had two weeks, but it would have taken two months to visit all of the places we wanted to go! We wanted to see as much of New Zealand as we could while we were there, and to cover as much ground as possible. We planned to drive, hike, boat, and generally explore the countryside. We wanted to experience everything that NZ had to offer. Well, everything except bungy jumping, that is! That is something I have always said I would NEVER do. But other than that, we didn’t want to miss a thing! Many people asked us if we were also going to visit Australia while we were down there; but we felt that this was not an option. New Zealand alone had way more to do than we could fit in; trying to do both countries in one trip would be completely out of the question! People are mostly under the impression that New Zealand is an island just off the coast of Australia, but that’s not really true; it is as far from NZ to Sydney as it is from London to Moscow! I would certainly love to visit Australia, but that will have to wait for another trip. After changing planes in Los Angeles, we headed for the other side of the world. I had been mentally preparing for the trip for months, dreading the seventeen hours of flying time and that awful feeling of claustrophobia and twitchiness that comes with long flights. First the five-hour trip to LA, and then we had the twelve hour journey to Auckland to look forward to. You know it’s a bad sign when your flight shows four movies! Are we there yet? We figured that by the time we arrived in NZ we would feel like zombies. But actually, I can’t believe how easy the flight turned out to be! It was a breeze, and I was even able to get some sleep on the plane, which I can’t usually do. I think I had somehow gotten myself into just the right mental state to be able to relax and enjoy the ride. I had willed myself to be calm and serene. Or maybe it was those 3 sleeping pills I took! Flying westward through the night, we overtook the morning in time to see the clouds below us bathed in the pinks and pastels of dawn. As we descended towards earth, we glimpsed green fields and long curving shorelines. We had arrived in New Zealand! Both Jineen and I were amazed at how good we felt! Having managed to get 3 or 4 hours of sleep on the flight, we felt reasonably well rested. We were full of anticipation as we arrived at one of the first places on earth to greet each new day. With some trepidation I had reserved a car from Rent-a-Dent, a company whose prices are attractive but whose name doesn’t exactly inspire confidence. We collected a little blue Toyota, somewhat reminiscent of my old Corolla at home (which again, didn’t inspire much confidence! ), and with great expectations we set off to explore New Zealand! Our first stop was a small farm near the Auckland Airport, where we had a cup of tea with the owners and saw some nice horses. Our trip was primarily a vacation rather than a horse-buying trip; but we couldn’t very well visit the country and not check out the horses! I have very much enjoyed working with the NZ horses that my friend Pedro has imported, and I was eager to gain first-hand knowledge of the equestrian scene there. And of course, conducting a little business makes those airplane tickets tax deductible! Leaving Auckland, we headed south towards Cambridge, where our lodging was booked for the night. 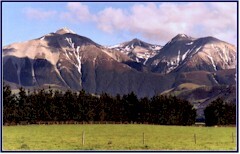 As we got further from New Zealand’s largest city, the scenery was increasingly lovely. November being late spring in the southern hemisphere, everything was green and all the flowers were blooming. The sun was shining and the air was warm, and we were filled with the giddy delight that comes from finding yourself at large in a new and unknown country. 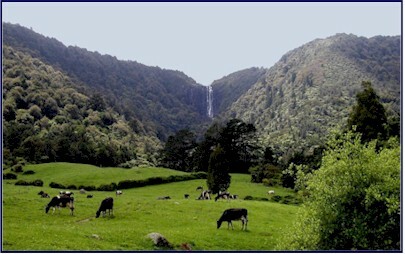 We were on the North Island, which is the more populated (though still very rural) of the two main islands. The countryside was quite reminiscent of England or Ireland, with green rolling fields and hedges lining the roads. And yet, it was not the same! One of the first things we noticed was that all of the trees were different; there were many types that I had never seen anywhere else. As we headed south, the countryside gradually became hillier. It was mostly farmland, with livestock grazing in the paddocks. But often livestock of interesting variety! In addition to cows and sheep, we saw large fields of red deer, elk, turkeys, chickens and even ostriches! Leaving the main road for smaller byways, we stopped at a scenic overlook above Lake Waikare, where we stood watching black swans on the water. Here we had our first wildlife encounter. We looked up to see a dingo crossing the road towards us! Was it attacking? Oh, no, wait, dingoes are in Australia, not NZ. It turned out to be a half-grown pup, scared but very friendly. But not very streetwise! As we got back in the car and left the layby, she followed us out onto the roadway. Fearing that she would be hit by a car, we turned around and drove up the small farm lane that the dog had come from, where, judging by the frayed rope still around her neck, she had escaped her tether. Driving slowly and encouraging her to follow, we returned her to her home; up a long driveway through rolling sheep fields, ending at a lovely house right on the shore of the lake. A woman was in the yard; we were sure she would be grateful that we had returned her dog. But she looked blankly at the puppy and said that she had never seen her before! But nonetheless, she agreed to keep her there and attempt to find the owner. So off we went, feeling that we had rescued the poor pup; our good deed for the day! In order to bypass the larger town of Hamilton, we took a ‘short cut’ from Huntly to Cambridge. This proved scenic but not particularly short, as the route was twisty and involved many turnoffs. This was only a problem because of the turn-signal issue. Being of British origins, in NZ they drive on the left side of the road. The driver sits on the right side of the car, so it takes a little getting used to. Having spent several summers in England and having visited Ireland often, I am pretty comfortable with this system, and I rarely end up on the wrong side of the road. But on this trip, I had one reoccurring problem; I would pull confidently up to an intersection, hit the turn signal indicator, and “Swaaaaarrrkkk!” I would jump suddenly out of my skin as the windshield wipers would screech across the dry glass. Of course! The turn signal indicators are on the right of the steering wheel, not the left! But for some reason I had the darndest time remembering it on this trip. In the afternoon we arrived in Cambridge and had lunch, and then checked in to our Bed & Breakfast. Because of the time difference, we had anticipated being really jetlagged and exhausted by now and perhaps wanting a nap. The time in New Zealand is 6 hours behind Virginia, and a day ahead. In other words, when it is 6:00 in the evening in Virginia, it is noon in NZ, but tomorrow! (This varies with daylight savings time.) Or another way to put it is that New Zealand is 18 hours and a day ahead of Virginia. So while for us it was 3:00 pm in Cambridge, our bodies thought it was 9:00 in the evening, yesterday! Confused? So were we. But amazingly, we still felt really good, and ready for adventure! We drove up Sanitarium Hill, so named because there used to be a sanitarium at the top. We followed a narrow lane which wound its way up the side of a large steep hill, with a series of switchbacks bringing us to the top. There we had an incredible view of the town and the valley below, and the mountains in the distance. There was a strong steady breeze, and the air had a wonderful smell of freshness and flowers that we soon came to associate with New Zealand. We got a close look at some amazing trees. 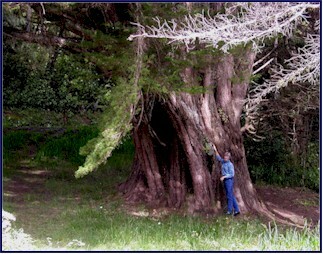 We saw enormous pines with huge intricately coiled trunks that must have been a dozen feet in diameter. We also saw a large smooth tree that’s outspread branches made a huge circular canopy, and everywhere the drooping lower limbs touched the ground they took root and formed new trees. The grove it made was like a magical fort! Leaving the hill, we then drove down past Lake Karapiro to the Maungatautan Mountain Scenic Reserve. We parked the car and went for what started out to be a short walk. We followed a path up the hill through a sheep pasture, crossing over the fences by way of stiles put there for that purpose. Reaching the forest we went up a gravel track, and were soon surprised to come across a huge fence, over twelve feet high, of densely woven chain link. All trees and vegetation were cleared away for about twenty feet outside of the fence. The bottom of it was dug down deep into the ground, and along the top was electric wire; there was no way anything without wings was going to cross that barrier! It immediately made us think of Jurassic Park; we were keeping a watchful eye out for velocioraptors. We followed the fenceline along the side of the mountain for a while, until the trail turned away from it and headed steeply uphill through the woods. As we climbed through the quiet forest we could hear only the breeze and the sound of bird songs. Occasionally we came to gaps in the trees where we could get a glimpse of the valley below. We were beginning to regret not having put on our hiking boots, as our afternoon stroll was turning into a considerable climb. After about an hour we came to the summit of the crest, and though the trail continued onwards toward the top of a bigger mountain, we turned back, as it was getting late. But we considered the climb to be a good bit of training for the hikes we planned to take later in the trip! Going down was much quicker than going up; but though it took less energy, going down the slope was in many ways harder on the legs. By the time we passed the Jurassic Fence and came back into the sheep pasture it was getting late, and even though the days are long at that time of year, it was starting to get dark. As we were leaving the fenced enclosure area, we saw a very fit looking man in hiking gear coming from inside the fence. Our path converged with his, and we had the pleasure of meeting Tony Rolley. It was time to begin our education concerning NZ wildlife! New Zealand has only two native mammals, and both are species of bats. But in it’s isolation from the rest of the world, many plants, insects and birds evolved in NZ that are not found anywhere else on earth. With no natural land predators, the bird life developed in abundance and great variety; and a number of them became flightless. Unfortunately, artificially introduced predators in NZ have decimated many of the native species. These foreign animals have disrupted the habitat and life cycles of many of the indigenous birds, and also of some of the insects that are unique to NZ, such as the giant weta, a large cricket-like bug that holds the distinction of being the world’s heaviest insect. In the mid-nineteen-hundreds many outside animals were imported for hunting, such as deer, rabbits, and wild pigs. Others, such as rats, snuck in by stealthier measures, and domestic cats and dogs that have gone feral have also wreaked havoc. The favorable conditions and abundant food supply in NZ have agreed with these intruders, allowing them to reproduce unchecked. The deer and rabbits have multiplied exponentially, and they have devoured much of the vegetation that makes up the habitat and food supply for many of New Zealand’s native species. Rats, cats, dogs and wild pigs feast on the birds when they can catch them, and also on the eggs and the insects. The stoat, a member of the weasel family, was introduced to try to control the rabbits; but it turned out that they prefer to eat the birds instead. All of this has been extremely detrimental to the native wildlife. Even the kiwi, the flightless bird that is the very symbol of New Zealand, is rarely seen in the wild now, having become an endangered species mainly due to artificially introduced predators. But most numerous and harmful of all are the Australian possums. They were imported in 1837, because they were said to be good eating and because their pelts were considered valuable in the fur trade. But bringing the possum to NZ was one of the worst decisions ever made, and now they are considered a harmful and dangerous pest! In Australia the possum population is not a problem; but upon being introduced to NZ the climate and food sources agreed with them, and having no natural enemies there, they have multiplied out of hand. In a country that is home to less than four million people, the possum population is estimated to be somewhere between 70 and 90 million! In these huge numbers, they devour the plant life that is the food source and habitat for many of New Zealand’s native birds and insects. They destroy the nests of birds, eating the eggs and the young. Much of New Zealand’s abundant native birdlife has been decimated by these pests; many of the species are now severely endangered. With their thick brown fur, big eyes and bushy tails, these nocturnal marsupials don’t look anything like the North American opossum; the main characteristic they share with these distant cousins is their propensity to be run over by cars. Indeed, we had already noticed that wherever we drove, we saw dead possums along the side of the road with surprising frequency. One of the reasons for this is that the NZ people consider them an undesirable pest, and make every effort to run them down whenever they have the opportunity! Tony Rolley told us about the fence. It was part of a project run by the Maungatautan Ecological Island Trust. This organization has built about 50 kilometers (a kilometer is six tenths of a mile) of this pest-proof fence, surrounding over 8000 acres of land in several different parcels, and is attempting to return this land to a natural and pest-free state. Having totally isolated these areas from the entrance of any outside predators, they then undertook a thorough and methodical program of eradicating all non-native pests from inside the enclosures, through the use of poison, traps and hunting. After a period of monitoring the areas to be sure that all of the offending animals were eliminated, then native birds and insects that are endangered, including the now extremely rare kiwi, will be reintroduced to this safe habitat. Then trails will be maintained through the enclosures, so that visitors to the Scenic Reserve may enjoy the beauty of this environment in its natural state! 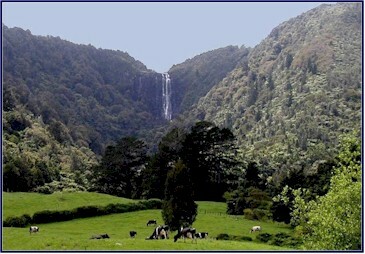 This extermination of pests may seem like a harsh and severe method, but after learning how they have adversely affected New Zealand’s natural balance and driven many species of birds to the brink of extinction, I can recognize how valuable this project is in trying to restore at least this small piece of NZ to its natural state. While we had had walked through the wooded path we had heard some beautiful bird songs; but Tony told us that the forest is now silent compared to what used to be heard there. 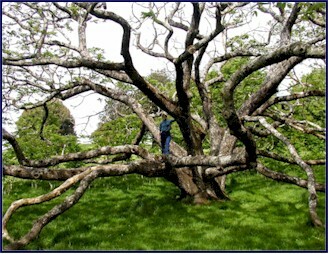 Unfortunately, as widespread and numerous as they are, there is no way that such pests as possums and rats will ever be eliminated from the majority of the country; but with projects such as this, perhaps at least small isolated areas will once again be home to some of New Zealand’s rarer and more unique birds. Tony’s job is to check the fenceline. He hikes around the perimeter of this enclosure to ensure that the fence has sustained no damage that might allow the passage of predators. Every day. Every single day, he checks almost ten miles of fenceline, on foot. It is the persistence and dedication of people like Tony that make such projects successful! It was really great talking with him and learning about these conservation efforts; and he also gave us some good tips about where to go hiking the next day! Before the trip a friend had given me a magazine article about New Zealand, and I reread it that evening. It talked a lot about the friendliness of the people, the beauty of the countryside, and the great opportunities to experience new things. The article concluded by more or less stating that if you visited NZ and didn’t take advantage of the chance to have some real and unique adventures, you were a total wimp. After reading it, I started to have this nagging doubt . . . maybe, just maybe, I should think about bungy jumping after all . . .
We woke up before six, full of energy and ready for adventure. We were to meet our friend Joanne at noon to spend the afternoon looking at horses; but in the meantime, we had things to do and places to go! We had a lovely breakfast at our Bed and Breakfast with the owners, Harry and Isabel. We asked them how long they had operated the house as a B&B, fully expecting to learn that they had been doing this for decades; we were surprised when they told us that they had been there for less than a year. Harry told us a very amusing story from his youth concerning his grandfather and Rufus the Rooster, and with a light heart we set off. Tony had given us directions to a place called Wairere Falls Scenic Reserve, where we planned to have a short hike (or tramp, as they call it in NZ). We drove to the town of Matamata (home of Hobbiton, as the signs proudly proclaimed) and proceeded towards the Kaimai mountain range. 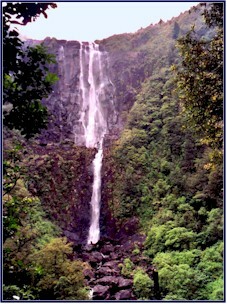 The morning mist was still heavy when we approached Wairere Falls. The top of the mountain was obscured, but we could look out across the cow pasture and see the white cascade of water falling out of the cloud and down the mountainside. Ours was the only car in the small parking area when we set out on the trail. We hiked up through the forest alongside a quickly falling stream. There were many enormous trees, and everything was covered with moss and vines; the floor of the woods was thick with ferns. It was beautiful and peaceful; truly an enchanted forest! We heard only the sound of the water, the songs of the birds and the whisper of the wind. After about an hour we came to a viewing point near the bottom of the falls. It was stunning! 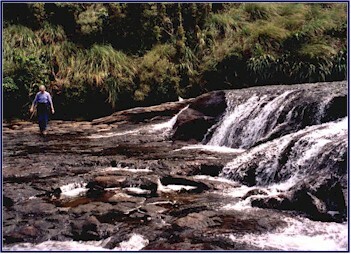 The stream issued from the top of the cliff and fell close to a thousand feet into a pool below. It was like something you would only expect to see in your dreams! The trail continued on, and we decided to follow it. It climbed steeply and wound around the side of the mountain, eventually coming out on a plateau at the top. Before us was a broad shallow stream, but here it flowed quiet and serene; you would have no idea that it was about to hurtle off into space! We were just upstream from the falls, where we could wade across on the rocks. It was a peaceful setting, you couldn’t even hear the falls; but when you looked downstream the little river just suddenly disappeared, with nothing beyond it but space and sky. 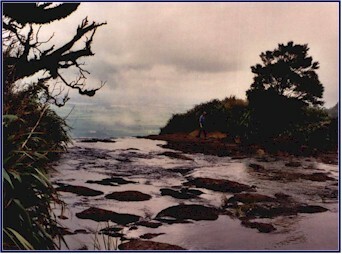 At the top of Wairere Falls. We spent the afternoon looking at some very nice horses, and then had dinner at Joanne’s house, complete with a good introduction to New Zealand wines. We went back to Harry and Isabel’s for the night, still amazed that we were not feeling the effects of jetlag. We were looking forward to tomorrow! Click here to read the next exciting installment of our New Zealand Adventure!